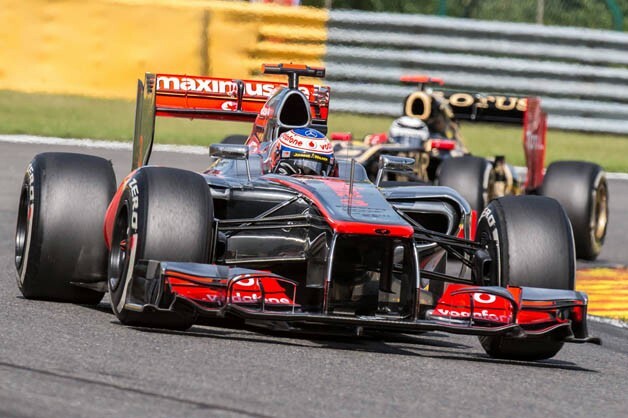 We know it's been barely over a month, but it sure seems like a lot longer since the last Formula One race. At the end of July, Fernando Alonso lead the standings ahead of Mark Webber, Sebastian Vettel, Lewis Hamilton and Kimi Raikkonen after eleven of twenty grands prix were completed this season. 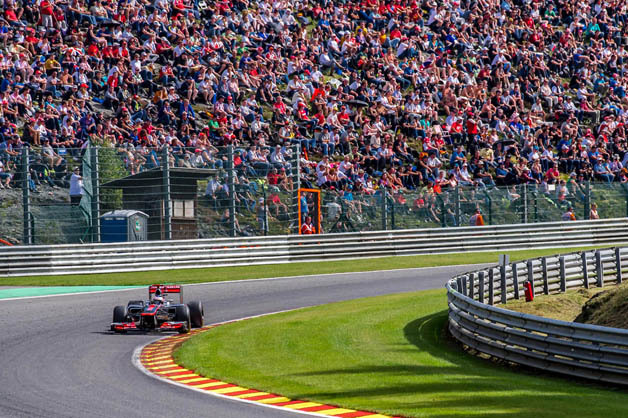 By now the drivers and their teams should be well rested after a month-long summer break, but it's back to work as the championship resumed this weekend with the Belgian Grand Prix from the indispensable Spa Francorchamps circuit. Keep reading to see how round twelve went down. Saturday's qualifying session saw former world champion Jenson Button land on pole for the first time since moving to McLaren two years ago. With all the champs on the grid, however, it was Sauber's Kamui Kobayashi who landed second. Williams' Pastor Maldonado placed third, but a penalty for impeding qualifying bumped him down three places and Kimi Raikkonen, who has made Spa his own, was elevated to third. 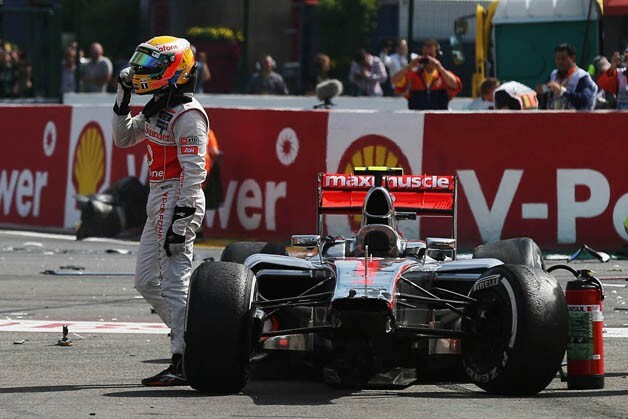 Sergio Perez and Fernando Alonso landed fourth and fifth, respectively, followed by Maldonado, Lewis Hamilton, Romain Grosjean, Paul di Resta and defending champion Sebastian Vettel, rounding out the top ten as his team-mate Mark Webber was bumped down to twelfth for a gearbox change. Michael Schumacher qualified in 13th and Felipe Massa 14th. Once the race got underway today, however, all bets were off. 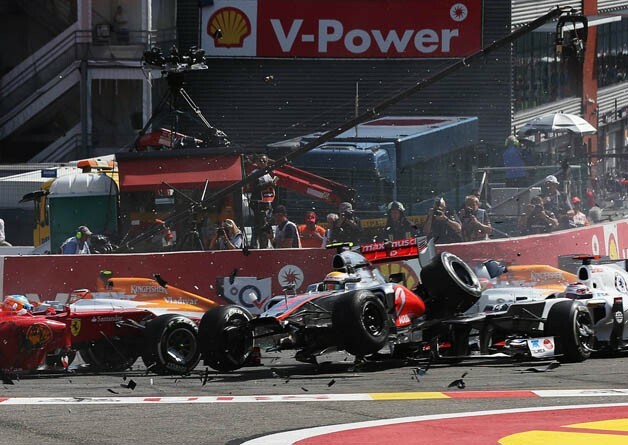 Heading into the corner known as La Source, a huge pile-up immediately took Grosjean, Alonso, Hamilton and Perez out of the race with no major injuries reported. The safety car was deployed with Button lead the weaving field behind it as Schumacher advanced from 13th to 5th in the commotion and Hulkenberg up to 3rd from 11th. With the safety car in at the start of lap 5, Hulkenberg cinched past Raikkonen for second place as Schumacher overtook di Resta for fourth. Vettel then overtook Massa for tenth and team-mate Webber for ninth as Button remained in the lead. As the first round of pit stops got underway Vettel seized the opportunity to advance all the way to third. 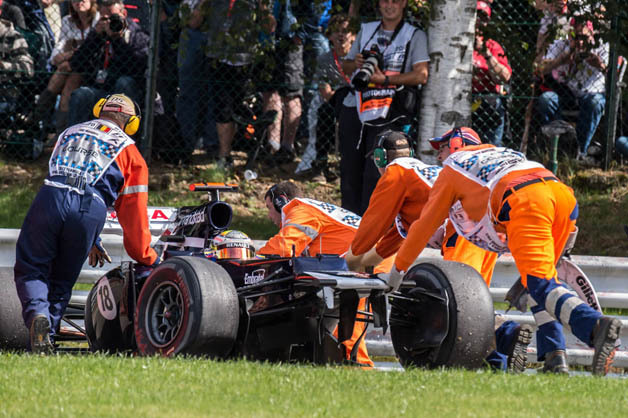 Button, Vettel and Scumacher all waited nearly to the half-way point to make their first pit stops, the McLaren driver re-emerging in the lead after a blisteringly fast stop. Lap 32 saw Narain Karthikeyan spin off and lose a wheel to a hungry tire wall, just before a resurgent Raikkonen took third from Schumacher in a hard-fought back-and-forth that re-staked Raikkonen's claim as the master of Eau Rouge. Hulkenberg then eased past Schumacher as well as Mercedes apparently switched him from a one-stop strategy to two. Massa then passed Webber for fifth in the battle of the leading teams' "other" drivers as Vettel held on to second, 14 seconds adrift of Button with Alonso still watching from the garage. Across the finish line after 44 laps, Button took a commanding win from pole, with Vettel coming second in a remarkable climb up the field and Raikkonen in fine form at his favorite track, rounding out the podium. 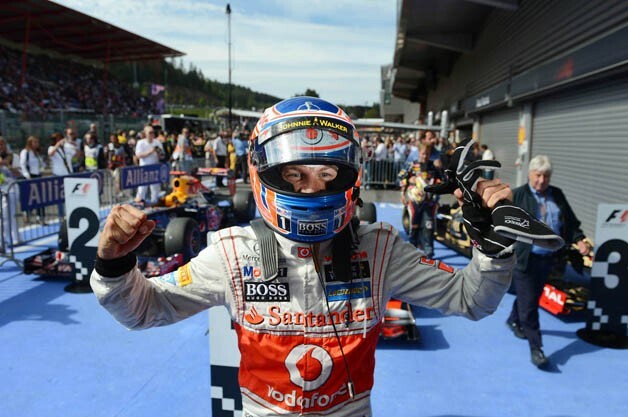 The remaining points went to deserving Hulkenberg, Massa, Webber, Schumacher, Vergne, Ricciardo and di Resta. Pastor Maldonado was retroactively penalized ten places for a collision with Timo Glock, but the greater penalty went to Romain Grosjean. 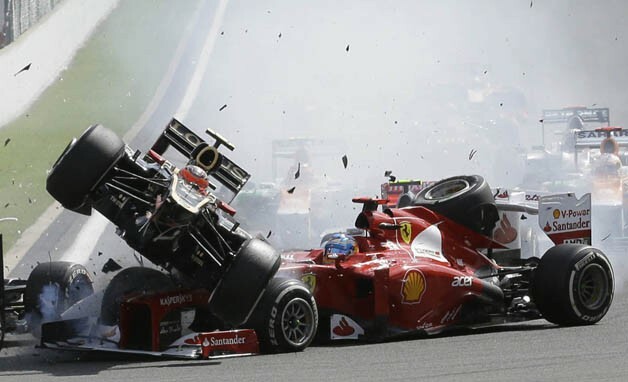 The Lotus driver was banned for the next race after having been deemed responsible for the opening pile-up. The results leave Fernando Alonso still in a commanding lead despite having been taken out of the race, with Vettel in second, Webber in third and Raikkonen just one point behind in fourth. Red Bull retains its lead in the constructors' standings, with McLaren in second, Lotus in third and Ferrari in fourth. The race resumes with the Italian Grand Prix (but without Romain Grosjean) next week from Monza.